Trafficking Victims Prevention and Protection Act Reauthorized! The Trafficking Victims Prevention and Protection Reauthorization Act, which passed the House and Senate a few weeks ago, was signed into law this week by President Trump. We celebrate that the work of so many dedicated people has culminated in the reauthorization of this Act. This bill is the fifth reauthorization of the Trafficking Victims Protection Act of 2000 with previous versions passed in 2003, 2005, 2008, and 2013. Ministries across the life of the Christian Church (Disciples of Christ) work to end Human Trafficking in its many forms. Thanks for your help in reauthorizing the Trafficking Victims Protection Act of 2000. Volatility in the financial markets is typical, but recent market swings have been unusually sharp and extreme. Markets are concerned about rising interest rates, trade wars, a rising budget deficit, political instability and a slowing global economy. Market corrections are part of the long-term investment process. Pension Fund of the Christian Church and the Christian Church Foundation have decades of experience weathering volatile markets. We have been here before and we know that by maintaining a long-term perspective and following a proven investment discipline, we not only can weather short-term market swings, we can use them to add value to our members and investors. Markets will rise and fall, but you can count on us to manage your dollars with care. We are grateful for your partnership and invite you to contact us with any questions. The Christian Church Foundation Board of Directors gathered in Dallas, Texas, November 9-11, for their final meeting of 2018. The meeting included worship together, conversations regarding new tax law, reports from our independent investment consultant, Prime, Buchholz and Associates, and welcoming our newest board members; Mr. Dwayne Bell, Owner-President of Excel Real Estate and member of New Covenant Christian Church in Nashville, Tennessee, Rev. Reggie Chapman, Pastor of Lakewood Christian Church in Lakewood, Colorado, Ms. Debbie Jennison, retired executive with URM Stores, Inc. and member of North Hill Christian Church in Spokane, Washington, and Rev. Dr. Christal Williams, Regional Minister and President of the Christian Church (Disciples of Christ) in Tennessee. The Board of Trustees for the National Benevolent Association was meeting in Dallas at the same time allowing the two ministries’ Boards the opportunity to have dinner together Friday night and learn more about each ministry. The Christian Church Foundation Board of Directors honored and recognized our outgoing board members on Saturday evening. Many thanks to Ms. Debra Clayton of Topeka, KS, Rev. Teresa Dulyea-Parker of Bloomington, IL, Mr. John May of Wilmington, NC, and Mr. Bob Williams of Dallas, TX for their faithful service to the church. The highlight of the Board Meeting was the approval of a new investment fund: the Bostick Select Fund. Rev. Sarah Lue Bostick (b.1868, d.1948) was one of the first women of color ordained in the Christian Church (Disciples of Christ) and served for over 40 years until her retirement. She was a devoted worker for the Christian Woman’s Board of Missions and the National Christian Missionary Society particularly in Arkansas, Missouri, Tennessee, Kansas, Texas, and Oklahoma. She worked to establish CWBM auxiliaries across Arkansas and collected an impressive collection of missions literature. This collection, given to the Disciples of Christ Historical Society after Rev. Bostick’s death, opened an unparalleled window into women’s and African-American studies in the Stone-Campbell movement. The Bostick Select Fund will continue to uphold the Christian Church Foundation’s commitment to being an active, faith-based investor, while also excluding investments in fossil fuels, weapons manufacturers, and companies targeted for divestment because of their involvement in perpetuating the Israeli-Palestinian conflict. At their Board Meeting, the National Benevolent Association committed to becoming one of the initial partner investors in the Bostick Select Fund. This fund, like Rev. Bostick and her ministry, represents a new approach to living out our faith. For more information about Rev. Bostick, please visit the Disciples of Christ Historical Society website. Two seminary students have been named the 2018-2019 recipients of the John and Maxine McCaw Scholarship Fund for Prophetic Living, Teaching, and Preaching. The scholarship fund, held in trust at the Christian Church Foundation and administered by the College of Regional Ministers, was created by the McCaws in 2012. Leah White, from the Tennessee Region, attending Claremont School of Theology. Stanley currently serves as the Student Minister at Slash Christian Church in Ashland, Virginia and is active in the Virginia Region. Stanley has her Bachelor of Science in Biology from Virginia Commonwealth University and her Masters of Urban and Regional Planning from Virginia Commonwealth University. Stanley believes God has been working with her in her everyday life allowing her to serve and work with low-income residents helping them build better communities and bringing them from the margins of society into the wholeness of the church. White serves as a Minister in Training and Co-Chair of Christian Education and Worship at New Covenant Christian Church in Nashville, Tennessee. She is active in the Tennessee Region and attended the Black Ministers Retreat in 2018. White has her Bachelor of Arts from Talledaga College and her Masters of Education Administration from Lipscomb University. She was a music educator for 21 years and, in addition to her ministry work, currently teaches in Tennessee. White believes that truly effective ministers must better understand how poverty, culture, language, gender, and abilities influence and shape people in their life and their walk with Christ and believes her theological education is supporting her in leading and empowering others to recognize these important intersections. The scholarship is the legacy of Dr. John McCaw and his late wife, Maxine McCaw. The McCaws established the scholarship to encourage a “prophetic” voice from the pulpit that seeks to eliminate evil and enhance goodness in human relations and in international relations. “The pulpit,” says Dr. McCaw, “must be informed, alert, emboldened, and fearless.” This scholarship provides resources to help ease any educational debt for future preachers. The scholars must complete an application process and are selected by representatives of the College of Regional Ministers. The recently enacted Tax Cuts and Jobs Act of 2017 called for many changes in tax law, tax reporting, and laws surrounding charitable deductions, among other things. Two such changes will significantly affect churches and affiliated religious organizations. These changes can be found in Section 512(a) paragraphs (6) and (7). These changes require new methods of calculation for tax reporting and payment for income earned through unrelated trades or business for churches and affiliated organizations and declare certain amounts paid by tax-exempt organizations to be taxable income (e.g., for a parking facility used in connection with qualified parking, for a qualified transportation fringe benefit, gym memberships, etc.). These changes have not yet been clearly defined and the reporting method for them is currently unknown. A delay in implementation of changes will allow churches and religious institutions time to ensure they are abiding by the new law and time to train treasurers, volunteers, and stewardship teams in appropriate new practices. An implementation delay will also allow the Treasury and Internal Revenue Service time to outline clearly the definition of these new requirements and create the reporting structures necessary for tax-exempt organizations to comply with the law. The Christian Church Foundation, Disciples Church Extension Fund, and Pension Fund of the Christian Church each represent the financial interests of the Christian Church (Disciples of Christ), managing over $4B in assets. As advocates for the financial wellbeing of all of our churches and affiliated organizations such as colleges and universities, nursing homes, children’s homes, and other ministries, we respectfully add our voices to those of organizations, including Church Alliance, the American Institute of CPAs, and the National Council of Nonprofits, among others, that have requested a delay in implementation of changes relating to Sections 512(a)(6) and (7) of the Internal Revenue Code that were enacted as part of the recent Tax Cuts and Jobs Act (“TCJA”; Public Law No. 115-97). We believe it is in the best interest of the Christian Church (Disciples of Christ) and other churches and religious organizations to delay the implementation of these new laws until Treasury and the Internal Revenue Service have accurately defined the measure of the law and created means to adhere to these new regulations or repeal this section of the law due to the undue burden this will place upon volunteer-based organizations. If you would like to add your voice along with ours, please click here and fill out the corresponding form. To read a full account of Sections 512(a)(6) and (7) please click here. To read the full statement by Church Alliance please click here. To view a full list of the Supporting Signers please visit the Pension Fund website here. The Disciples Personal Care Pantry is a vital outreach ministry to the community. Over the last two years alone, the Pantry distributed personal care items such as toiletries and cleaning supplies to over 300 local families. Edith Kelly-Green, lay leader and member at Mississippi Boulevard Christian Church in Memphis, Tennessee, believes that just as we make plans to take care of our families when we are gone, we are called to ensure that our church is taken care of, too. Rev. Hellner-Burris served with Harry for years as board chair, elder, trustee and choir member at Wilkinsburg Christian Church. She couldn’t agree more with Dr. French’s kind words. I was introduced to Harry as I transitioned to regional ministry following Dr. French. Harry served the region as the chair of the regional new church start in Cranberry Township, PA. The church start required many hours and detailed plans, and I quickly learned to appreciate Harry’s organizational and planning skills. An engineer by profession, Harry brought the skills from his career to help the church. More importantly, what Harry brought to his service in the congregation and region was a devotion to giving his best for Christ’s ministry. Through his time, skills and financial resources, Harry always gave his very best. Harry’s commitment to the church did not only span one congregation. Prior to his final years at the Wilkinsburg church, he participated at East End Christian Church. During the winter months of his retirement, he and his beloved wife, Gladys, attended First Christian Church of Ft. Myers, FL. His commitment to God and the church could not be confined to a single location. Wherever Harry lived, he gave of himself. Although it’s easy to remember Harry’s life and service, Harry and Gladys made careful plans to distribute their remaining assets after their deaths. The church and its ministries were beneficiaries of their generosity. As in their lives, so too in death! The congregations Harry served in Wilkinsburg, Ft. Myers and the Pennsylvania region received proceeds from the Cotabish estate, extending the couple’s love for these ministries well into the future. Through the Christian Church Foundation, the Christian Church in Pennsylvania created the Harry N. and Gladys N. Cotabish New Church Establishment Fund to encourage continued interest in planting new churches. Harry Cotabish was a consummate gentleman indeed, and a true ‘saint’ of the church. Making a charitable contribution is a great way to extend God's presence to others. There are many options available for you to make a planned gift. We can help you determine the best path for you. Contact us today to get started. 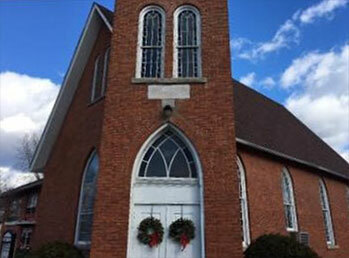 The little congregation of First Christian Church in Ravenswood, West Virginia, had fallen on hard times. They had a dozen of faithful members in attendance, but all of them were aging quickly. The community had taken a downturn years before, and options for growth and renewal were not showing much promise. The congregation held enough properties, stocks, and cash to continue their gathered presence in their old decaying building. However, they were concerned that at the rate they were going, regular budgetary income was not going to allow them to preserve their assets for the future of ministry in that place. After careful analysis, the trustees of the congregation worked with the Christian Church Foundation to create a permanent fund and a “Last Will and Testament” describing their intentions and desires for an ongoing ministry for the church -- even after they ceased to meet in the old building on the corner of Sand and Gallatin. Within a year or so, the group determined they could no longer expect to meet for worship and Sunday School as they had for so many years. It was time to execute the Will. The congregation’s wishes were immediately implemented, allowing the continued support of the local hunger ministry, Week of Compassion, and the Christian Church in West Virginia. Two of the congregation’s members transferred their membership to the Parkersburg congregation, and all of the others were received as members of the Regional Church. An “estate sale” was conducted and more funds were raised. The proceeds from sale of the parsonage and stock portfolio, along with much of the accumulated cash, were added to the permanent fund at the Foundation. The church building was kept in the care of the Region. Today, the building houses a recovery ministry and serves as a space for community groups to gather. The small home adjacent to the church building is held locally, as well. An immigrant family has lived in the home for many years as they settled into the community, and they fondly remember joining the congregation for worship periodically. Their youngest child was blessed and dedicated in the church. Former members of First Christian Church remain a vital part of Ravenswood’s life, and continue to provide salt and light in a place where God’s presence is much needed. For one historic congregation, the ending of a full, rich era of life in ministry will bless coming generations in ways that its faithful members had dreamed, planned and took action for. This is the life beyond life that the gospel speaks of. This is faithfulness that has no known end. If you would like information on creating a legacy plan for your congregation, contact us at (800) 668-8016 or info@ccf.disciples.org.